TMNT 4, originally a 1991 arcade game, was ported to SNES in August 1992 and closely follows the formula of TMNT 3 for NES. The twist comes when Shredder sends the turtles back in time, where the foot clan is already there to fight them. Battle Bebop and Rocksteady in the past, Krang in the future, and finally return to the present, 1992, to fight Shredder and recover the stolen Statue of Liberty. Note: the game's timer at the end isn't used because it is buggy. Best time as Raphael: Hard mode 0:19:24 by 'sinister1' on 2014-04-05. Big thanks to Mike Uyama who pushed this game really far without much help thereby inspiring me to push it as far as I could. This is a game I loved as a kid and one of the first runs I ever watched on SDA. Mike Uyama's 2006 run stood the test of time and even watching back in 2012 it was still as enjoyable as ever. I first got back into the game when I asked Mike if he had any interest in doing a co-op run for AGDQ 2012. He showed me some basics and I started playing on my own to learn before we would actually start practicing together. I really overestimated my abilities because I remember being good as a kid, but I was really bad now. I eventually got the movements down well enough to play with Mike and not be totally embarrassed. We quickly figured out that skipping enemies was not happening in co-op thus making the run somewhat of a bust. After AGDQ 2012 was over I was still really enjoying playing the game. Raph does that. He is just so damn overpowered that it is addictive to just crush the game with him. I set my sights on beating Uyama's 22:31, a run we both agreed was improvable and at least sub 22 was in order. As I approached that magic number Mike and I were asked to be on a new speedrunning show called The Sunday Sequence Break. According to Mike this is what really sparked his interest and got him back into the game. He quickly started crushing my times and I realized that I could not compete with the mighty dictator. He whittled the time down slowly until it was at an unreal low of 20:20!! Over 2 minutes faster than the old run. It was over. No one would ever beat this run except Uyama himself and he was retiring from the game, finally happy with his run. Fast forward to an online marathon called Happy Tails organized by Goobi which had an animal theme. Turtles are animals, err, reptiles. But that is like an animal right? 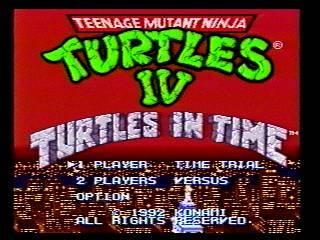 I was pretty sure Mike was busy and would not be playing in it so I offered TMNT IV since I still loved playing it. I did some practice and actually managed a meager improvement over my previous best. I felt good about it and remember wanting to push my time to a respectable level. Sub 21 seemed a nice goal since I knew I would never beat Mike, maybe I could just get close and feel like I was an actual competitor. But how would I do this? Enter the game changer, or should I say the Game Saver. A device I had first seen at AGDQ 2013. I absolutely despise emulator practice but Game Saver allows you one save state on console. I found out how cheap they are and got one with the hopes that I could become decent at Super Metroid. I ended up using it for TMNT IV instead. I put myself in full on practice mode and started grinding on Uyama's strats to improve my time. At some point, I don't know exactly when, I figured out that some of his strats were improvable. I tinkered around with some things and eventually starting uncovering some good stuff. I studied the TAS, old runs, anything I could get my hands on. Then came the breakthrough moment. I was having the run of my life which of course was derailed but I went back to review the footage. I realized that after stage 6 I was right on par with Mike's 20:20. I could hardly believe it. Was I good enough to compete for this run? I was. I got back to the strat grinding and went one level at a time until I was satisfied with every single screen. It was not long until I toppled Uyama's 2012 masterpiece but I felt my run was still not worthy. I had beaten him by guile and trickery, not by pure skill. Translation: my execution was still not good enough. Uyama had the most masterful control of Raph, and I still felt like I was hanging on by a thread at times. As I continued playing my control became stronger and stronger until eventually I tamed the beast that is Raph and felt I could only be stopped by Krang luck. My first sub 20 run was pretty good, but still not what I wanted. I eventually got a 19:46 that was amazing except one little thing. I died in stage 6 due to the greatest programmer in the history of video games: Cannonball guy. Those things just lock in on you like a heat seeking missile and crush your hopes and dreams in an instant. I had to keep going until I could get a run that had no unintentional deaths. Eventually I had to settle on a 19:43 because AGDQ 2014 was approaching and I needed to practice my games, none of which were TMNT IV. I said I would come back to the game after the marathon and get the run I really wanted. After AGDQ 2014 I got to de-rusting and my first run scared me because I could not even remember what my strats were. Things came back pretty quickly though as I got sub 20 my second run. We were off to the races and it would all come down to Starbase. I found a few minor strat upgrades, but nothing major and was able to finally get a decent Starbase when I had a big lead. No 3 round Krang, but hey that is to be expected. I would eventually get a 19:38 that beats the previous run by a whopping 42 seconds. A feat worthy of Splinterface. I submitted my run, but for some reason as I went to rewatch it I kept seeing potential improvments. I got back on the strat grind once again and amazed even myself by eeking out another 10 seconds worth of improvements. I had to get back to attempts so I derusted once again and on my first night of attempts got a ridiculous 19:25 mostly due to solid execution and a 3 round Krang which is worth 7 seconds by itself. I had one unintentional death but the rest of the run was so strong that it is still 13 seconds better than my previous submission. I want a deathless improvement but it will be very hard to come by because now 3 round Krang is absolutely necessary. Something that is quite rare for anyone not familiar with the game. My biggest time savers in this stage were to get Krang on screen faster and a new way to fight Baxter that kills him at the top of the screen so he insta-dies. There is a way to get the screen to scroll faster after Krang shows up but I have yet to fully understand it. Overall this stage was not perfect, but it is still passable. 1 - 2 seconds can be gained here. This stage was one of the most mysterious to me. I use a combo of Uyama's and my own strats. I think I finally figured out the optimal fence section strats, but sadly missed my tech and had to improvise a back up strat. This level is improvable but 2 -3 seconds. So paying too much attention to my stream chat and getting hit is kind of like a tribute to Uyama's 20:20 run where he does the same thing. I was supposed to just suicide to regain full health with getting a pizza. Pizza goes toward the score countdown at the end of the stage and costs some amount of frames. I think it is funny that this happened in this particular run, more on why later. As for improvements, there could be a faster way to kill the boss like in the TAS but I cannot figure out how to pull it off yet. Not much in the way of strategy upgrades here other than a minor enemy manipulation in the screen with the Blue sword guys that ensures they all die in 1 slam. Delaying the bomb pizza is a nice piece of tech because it greatly reduces randomness of the final section before Tokka and Rahzar. The key screen here is the one with the blue sai foot soldiers and mousers both of which are quite random. The Shredder fight went well because I got very good luck. This would be a tough stage to improve upon but a few seconds could be picked up with better luck. Huge strategy upgrade here with the addition of the TAS strat that allows you to skip the final Pteradyctl and scroll the screen much sooner. Other upgrades include the bomber section and the final screen before Slash using better movement and enemy grouping. My execution in this stage is really good minus the failure to group the 2nd set of Stone Worriers. The vertical lines you have to be on in this game sometimes are just really so precise that even one pixel too high or too low can mean missing an enemy. A few seconds to be saved in this stage. I came with a variation on the opening of this stage that saves a good chunk of time and made some other minor adjustments throughout. My execution is on point for the most part and I even pull a psychic dodge on the cannonball. One error toward the end when I go for a screen throw on a foot soldier and get bombed. You can scroll the screen faster with that setup if done right. Again, some time can be saved with a perfect stage, this is starting to become a theme of this run. More big strat upgrades in this stage mostly having to do with how the stone worriers are handled. There is also a way to group some enemies for a flip tackle kill that allows you to skip 2 purple foot soldiers but I could not get to the right line for that. I mess up what is a very easy boss fight because my stream had been crapping out a lot during this run and it was a distraction. Thankfully I was able to recover and barely pull off a kill. Yet again, a few seconds can be gained here. Shoutouts to Uyama for finding this faster boss kill which saves 1 cycle. I did figure out you can dive kick Krang before unloading your specials to guard against those rare cases where he has hp left over and you have to hit him with a normal attack for the final blow. So again I am still very distracted by my stream crapping out because I know how good my run is. I get hit and standard procedure after that is to suicide so you can regain full health without having to get a pizza just like in the first autoscroller. I decided for some odd reason to wait and try to suicide on the electric things which was clearly a mistake and I lose some frames by collecting the pizza AGAIN. Adding insult to injury, I will never hear the end of this from Mike because I bugged him so bad about it when he got his 20:20. This is the hardest stage in the game to formulate strategies for and to execute in. The enemies are random and they are plentiful. I tried to optimize the stage as much as possible and found a lot of good tricks including some enemy skips, better stone worrier strats and a few other minor things. I got a bit unlucky early in the stage with one of the little robot dudes doing a wild pattern that wasted a bunch of time. After that I just went to town on the rest of the stage. My Krang fight was kinda bad because I was just in denial in round 2 thinking he was at the low height where you can special him when clearly he was not. It is also possible to get 2 specials in on one cycle in when he does his atomic drop, but I missed that and had to wait for the 2nd drop. I got good luck here and was able to hit Shredder after his first teleport which makes it easy to setup killing him at the top of the screen after his 4th teleport. This fight is pretty straight forward and there is not really time to be saved here. The run was pretty well executed overall but the real key was all the new strats and that I got very good luck on the two big RNG bosses. The sad thing is that I could have a much better executed run that is still slower due to boss luck. That is one of the hardest things about speedrunning for me, because I prefer that my execution is really good and luck is whatever. But this run was kind of the opposite of what I like. This run can be pushed a bit further and I would like to get at least a deathless improvement even if it is only 1 second. I think there are still strat improvements to be found, but I am running out of ideas at this point. My hope is that other people will start getting involved in running this game because I have no doubt that there are still new strats to be found. A new TAS would certainly be helpful.